The Swedish moose test is known to have victimized many in the past, including the Toyota Hilux that massively failed. So knowing that many cars from trusted and leading automakers have failed, how do you think Tesla's all-electric Model X will do? Surprisingly, it did very well. But before getting into detail, it was confirmed last week that the Tesla Model X officially became the highest safety rated SUV, earning a 5-star rating in every single category from NHTSA. Though the moose test is not part of the NHTSA, the Tesla Model X did particularly well in the rollover test, all thanks to its battery pack located at the bottom of the chassis - developing a low center of gravity. So going back to the moose test, for those of you who don't know - it is an evasive maneuver test that consists of determining how well a vehicle can evade a suddenly appearing obstacle that could take an entire lane, for example, a moose. Now we know where it got its name from. The tests were done in different levels, from 70 kilometers per hour, 72 kph, and finally 74 kph. Though the Tesla X took down a couple of cones, never did its wheels leave the surface of the road. That is quite unusual for cars that take on the moose test, but it is definitely a good sign! This skill can be attributed to the low center gravity it has that also helped the all-electric car during its NHTSA test. 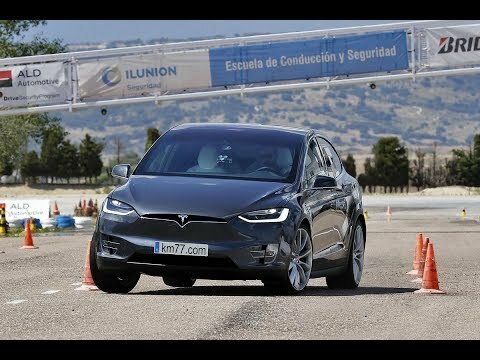 With such an impressive performance, the Tesla got a good score in the test. In the past, many SUVs and trucks did not pass the moose test, as the vehicles did not respond well to the obstacles at 65 kph. Some of them even resulted to near rollovers. But even if the Tesla passed this test with flying colours, we could tell that it still struggled at some point, at speeds over 70 kph. It definitely is a tough challenge. Just for comparison's sake, the Tesla model S took this test before as well and did well up to about 88 kph. And to compare it with the Audi Q5 2017, the Audi did slightly better than the Tesla Model X at 82 kph. An impressive result from the moose test certainly boosts its reputation. It will make drivers feel more at ease especially when a moose all of a sudden sprints in front of the Tesla Model X. So if safety is your top priority when it comes to choosing a car for yourself, or your family, you know that the Tesla X should be on your list.